In January 2012 (more than 3 years ago ;-) Birinyi Associates has sent out bullish notes, one of them about the Golden Cross:-) [...] they note that the S&P 500′s 50-day moving average is about to cross above its 200-day moving average, a blessed event known as the Golden Cross, which is the polar opposite of the (occasionally) nightmarish event known as the Death Cross. extract from these computations: From the 1st Feb. 2012 up to 30th July 2015 the Signal from the Golden Cross is LONG - resulting in a gain of > 59% in the last 878 Days in the market - alone in the index (not speaking about the performance of possible stock-investments during that time-frame) - fyi: the BUY/LONG-signal is still in place, but - especially after such a long time - be aware of a possible Death Cross ( = being the opposite of the Golden one). 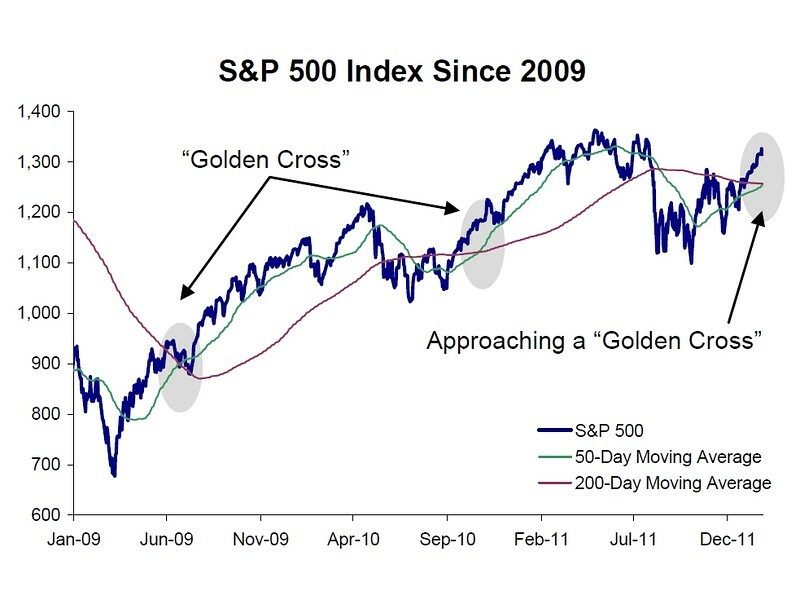 1) Recheck the Golden Cross in August 2014 indicating a buying signal @ ca. 2,200 points in the Index! 2) Recheck the supporting power of the SMA200 (blue line) after the intermedium "Crash"/Correction @ ca. 3,400 points in July 2015 (there are rumours in the market, that the Chinese officials are buying the dips around that long-term support - could be coincidence...Anyway: IF the weekly close falls below this 200-day-average the Chance/Risk-Profile may be against the investors).